Yesterday I made cheera sambhar, usually during Sunday menu sambhar will be there as main curry dish along with other sides dish and rice. My hubby love sambhar, and during his bachelor days he often made this spinach sambhar, some time he makes broccoli sambhar too. After marriage I tried spinach sambhar but not yet got courage to try his second version of sambhar. Amma usually makes mixed vegetable sambhar as well as with shallots, trust me the second one is most tasty. It is one of the common curries all over south India. They make their presence during breakfast, lunch and dinner. I make spinach rice whenever I get the spinach, this time hubby told me to make spinach sambhar, may be he was missing it for long time. Standing for long time is becoming a hard task for me. My back hurts like hell; sitting for a long time is also a tough choice for me. Cooking dishes for a long time has become a herculean task, I will be happy if I can make one side dish, curry and rice. What else you can expect in the later stages of pregnancy, night sleep means waking every hour for peeing intervals. Coming back to cheera sambhar it is one of easy dish you can prepare if you have sambhar powder in your hand. I make this sambhar slightly different than the other version. Here I used to fry the onion first and then wilt the spinach and then boil with tamarind juice. When it starts boiling, add sambhar powder and then add cooked toor dal or split pigeon peas to it. According my hubby’s request I boiled a potato along with toor dal and added to this. Finally seasoned sambhar with curry leaves, mustard seeds, red chilies and asafetodia. This is ultimate combo of iron and protein rich curry. About spinach and lentil you know to health benefits, I don’t need to repeat it. Try this one if you want change in your daily routine meal. Here goes the recipe. In a pressure cooker , cook toor dal and potato with 2 cups of water for about 3 whistles or 15 minutes and set aside. In a medium sauce pot heat 1 teaspoon of oil and add chopped onion and let if fry for 6 minutes or until they become translucent or change color. To this add chopped spinach turmeric and salt and let it wilt for about 2 minutes. In the mean time extract juice from tamarind with ¼ cup of water and set aside. popping switch off and add it to curry. Enjoy with rice and other side dish. Healthy and yummy as well! I have finally bought some red lentils and I’m trying to decide which yummy dish I will be using them for. I got some spinach too, so maybe this is going to be the one! Looks delicious! I love spinach …looks very delicious and yummy! Very healthy and yummy dish. Wonderful presentation. Super comforting sambhar,prefect to enjoy with hot steaming rice and papads. Nice to see new look in your blog,healthy sambar looks yummy..i liked the twist of adding potato in this recipe. I think I’ve said on other occasions: I love that mastery in the use of spices. The recipe is very tasty. this looks so pretty – a perfect fall/winter dish, no? my partner would just adore this! In fact, we have a potluck coming up…hmmmm..
Hi Swathi, I made somethig similar but with others ingredients, this is very healthy and yummy. Congrats for the new look of your blog. Me encantan éstos ricos ingredientes lucen absolutamente deliciosos,very very nice,abrazos hugs,hugs. Your Spicy Spinach and Lentil Curry sounds very appetizing! Special curry which i always look forward to have it wirh some rice, ghee and papad. Lovely one Swathi and the header looks awesome. Congrats on the good news and when is the baby due and I am sure your elder one should be all excited to have a sibling. Take care Swathi…have loads of rest and mild exercise…. Eat more such healthy dishes…love your keerai sambhar. Cheer sambar is a great idea..I will try this too…how r u dear ?? I can imagine what u r going through ..is somebody going to come there to help u when baby comes?? 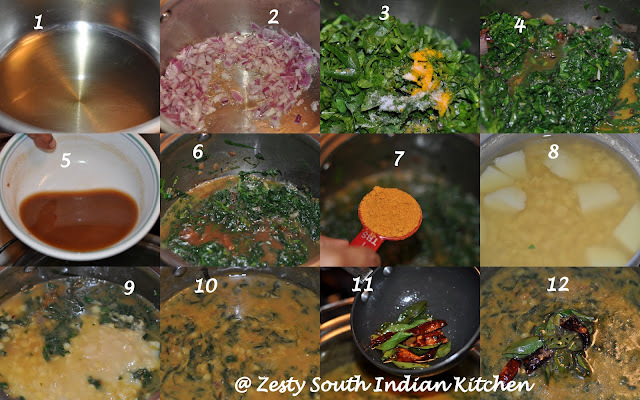 Such a beautiful, delicious, and comforting dish, Swathi…love the texture, and the flavor! Packed with flavor and so healthy and delicious! You all must be getting excited for your new bundle of joy! nannayittundu………….. PLS VISIT MY BLOG AND SUPPORT A SERIOUS ISSUE…………..
Wow, this dish is a flavor and nutritional all-star! Love spinach .. comforting dish. This looks delicious and hearty! Thank you for sharing this recipe with the Hearth and Soul Hop and thank your for hosting. This looks like a lovely and healthy curry Swathi! You knwo whenever i see lentils my heart warms, this is really comfort food for me. It looks like something I’d dip some bread into!